Opening to a balcony or terrace, all air-conditioned apartments of Fridas come with 1, 2 or 3 separate bedrooms. Each has a seating area and a kitchenette with hobs or mini oven and hobs. 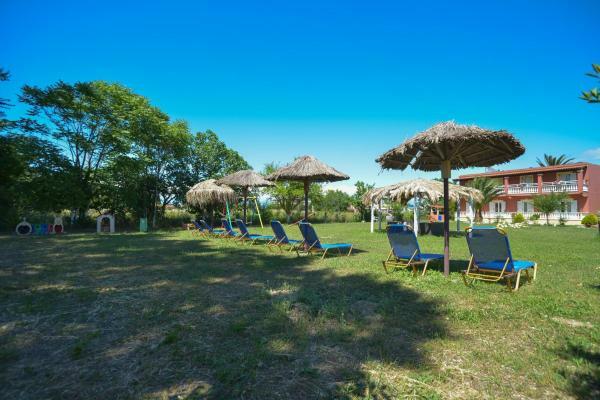 Located in Sidari Village, within 300 m from the beach, Fridas Garden offers a garden with BBQ facilities. It features fully equipped accommodation with garden views and free Wi-Fi. The property is 800 m from Canal D'Amour Beach and 200 m from Esperii Port. A water park, a supermarket, an ATM and restaurants can be found just a few metres away. Corfu International Airport is located 35 km from the property. The property offers free private parking. Nice garden with grill and decent apartment but awful service. The kitchen is badly equipped, doesn't even have a sharp knife, in the bathroom toilet paper or soap. Please inform Fridas Garden in advance of your expected arrival time. You can use the Special Requests box when booking, or contact the property directly with the contact details provided in your confirmation.